Our product range includes a wide range of automobile tool trolley. 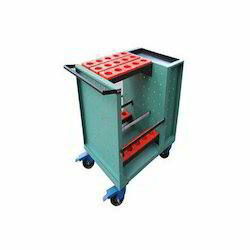 Automobile Tool Trolley guarantees the safe transportation of tools. They provide tools transportation with large capacity & safety.They require little storage space, shorten distances in the storage area and reduce issuing times and setting-up costs.Available in different sizes,number of drawers,top materials and colours.